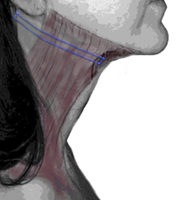 It is common for both men and women to experience a sagging appearance in the neckline, often called the "turkey neck" that can be bothersome. The Waddle Neck Lift is a variation of a traditional neck lift, developed and offered exclusively by Dr. Henley. Traditional neck lifts are extensive surgeries, and often do not carry a long term results. Dr. Henley designed a muscle suspension procedure that was less invasive, can be done as an outpatient, with superior results. He has presented this technique at national conferences. The Waddle Neck Suspension Lift threads a soft pliant material to suspend and tighten the neck structure. 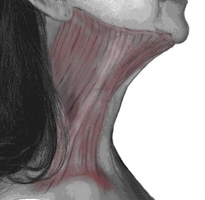 Some cases where there is significant neck laxity, skin removal may still be necessary. The Waddle Neck Suspension is most effective in combination with other procedures including neck liposuction and an upper cheek lift to address the jowls and mandibular angle. The graphics below simulate how the neck suspension procedure is performed.